In a televised address on Thursday night - the eve of the 13th anniversary of the September 11 attacks - President Obama announced what everyone already suspected, a new chapter in the War on Terror was about to start. He painted a dark picture of a new evil threat. 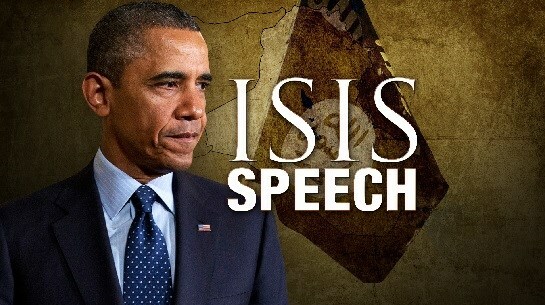 "ISIL is certainly not a state...it is recognized by no government, nor by the people it subjugates. ISIL is a terrorist organization, pure and simple. And it has no vision other than the slaughter of all who stand in its way." No, IS is certainly not a state, but it is quickly becoming one. As VICE News has shown in the Syrian city of Riqqa, IS is developing institutions and infrastructure in a surprisingly rapid manner. They've established Sharia schools for their young and military training camps for their adolescents; they've instituted a "justice" system complete with Islamic judges, magistrates and governors, a quasi-police force, prisons, and more; and they have began to literally destroy the borders between Iraq and Syria. And though IS is not recognized by any sovereign government, it is factually incorrect to state that IS has no support from any of its subjects, however bad we may want to believe it. The modus operandi of terrorist organizations throughout history has been to capitalize on the young, the poor, and the disenfranchised. IS has done exactly that, and to large success in the territories they control. Again, stating that "ISIL is a terrorist organization, pure and simple" does not make it that simple, and claiming that IS "has no vision other than the slaughter of all.." does not make it so. On the contrary, IS does have a clear vision, and they've used slaughter as their tool to achieve it, which is exactly why this group is utterly frightening. IS has in fact been operating in Iraq for almost a decade. On pamphlets released by IS in 2006/2007 they stated "modern notions of statehood and national borders must be discarded" and that, with regards to their citizens, "improving their conditions is less important than the condition of their religion." President Obama's simplified generalizations of IS are intended to serve as comforting reassurances, but do not contribute to a greater understanding of IS and how to confront the threat they pose. "Barbaric" is often synonymous with "primitive". Yet it is important to understand that while IS from modern influences on culture and religion, it has been vocal about its willingness to embrace modern technology to establish their caliphate. IS will not turn from social media and video-cameras; they will not choose a sword over an automatic rifle or anti-aircraft missiles; they will not disregard modern notions of wealth in their day-today operations. Across the border, in Syria, we have ramped up our military assistance to the Syrian opposition ... Already, allies are flying planes with us over Iraq; sending arms and assistance to Iraqi security forces and the Syrian opposition. It's no secret that the Obama administration has long been opposed to arming the "Syrian opposition," a euphemism for a fragmented and disorganized coalition comprised of literally dozens of arms groups. Indeed, the president's administration was so grounded in their stance that the US Ambassador to Syria, Robert Ford resigned from his ambassadorship over his misgivings with Washington and his inability to support their lack of involvement in the brutal civil war. The subtle yet matter-of-fact manner in which Obama lightly glanced over this fundamental shift in policy is surprising, to say the least, and leaves one to wonder what gave him the final push. Was it the recent be-headings of the American journalists James Foley and Steven Sotloff? Domestic politics at work in the run-up to midterm elections? Or perhaps, on the eve of the anniversary of the most tragic attack on our nation, President Obama in fact views IS as a direct threat to the United States.